Luxury holiday farmhouse in the Midi-Pyrenees, France: what's on the doorstep. Our village is a farming village and full of warm hearted people who love you to wave or stop for a chat – in French of course! We have a traveling bread lady (who will drive up to the house each day if you ask), a fabulous church and bizarrely a beautiful football pitch! 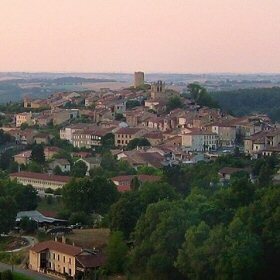 Medieval Aurignac is a 4 minute drive and provides all amenities from food shops, bar & restaurants to a little cinema! Do explore its museum, church and old medieval streets that sit above the main area. A few of the shops even open on Sunday mornings. Unusual but very convenient! The area is well known for adventure sports and you’ll be able to do everything from rafting & riding to cycling. Equipment is available for hire and you can find details in the house file.